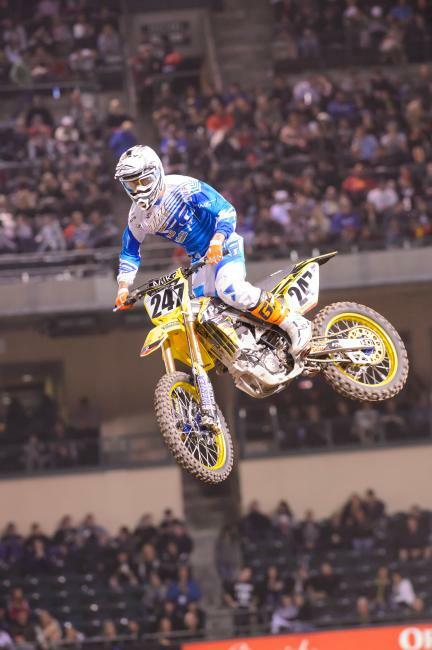 It had been nearly four years since Teddy Parks made a main event when the Privateer Journey team rolled into Arlington, Texas. His previous, and only 450SX, main event happened way back in 2010 in Toronto—where every 450 entry made the main due to lack of riders. Parks doesn’t even acknowledge it himself: “I think there was only like twenty riders there. So, I didn’t really count that as making it,” he says of that March night in 2010. Throughout the long journey back to the pinnacle of supercross, Parks has remained steadfast in rejoining the elite supercross talent in the world. Growing up an hour north of Dallas, Parks reinsertion back to the main could not have come in a better place for the long-time journeyman. While it seemed surreal at the time to Parks, his fourth place in the semi over Eli Tomac and Ivan Tedesco brought him to the forefront of supercross for the first time since 2010. Racer X: Before we get into your ride at Dallas, tell us about yourself. Teddy Parks: I’m from Princeton, Texas, which is about an hour north of Dallas. I’ve been riding since I was 10 years old. I went pro at 16 and started racing supercross in 2008 when I was 19. So this will be my fifth year of supercross—fourth year on the 450. This past week at Dallas was the first main event I’ve made on the 450 [Ed Note: excluding the 450SX main in Toronto in 2010, which we explained above], which was pretty exciting. What did it mean to get into the main at your hometown race in front of family and friends? Yeah, it couldn’t have happened at a better place. I’ve had so many friends pulling for me all year, and I’ve had a rough year, so to have all my friends and family … this was the first time my sister came, and my brother and all the grandkids were there. I think all my friends I grew up with in school were there. It was so unreal. To go across the finish line and see that I qualified, especially out of the semi, was amazing. Well, on the line all I thinking, because where I was at, I wanted to get a good start so I could get a good gate pick for the LCQ. That was my goal. I came around the first corner in second place and I was like, “Okay, just hold it together.” I had messed up in Oakland and keep looking back and ended up getting taken out. I wanted to keep moving forward. I ended up coming around the first lap in fourth, so I knew all I had to do was everything I could to get top five. I wanted to look back so bad to see who was behind me. Thankfully I didn’t because it was Eli Tomac and that would have definitely got in my head. I knew if I fought as hard as I could to beat whoever that was behind me I could get in because they take the top five. So I just rode my own race. When I crossed the finish line and realized I had finished fourth … it was just crazy. So you didn’t know Eli was behind you? No, not at all. That would have probably got in my head. I mean, beating Tomac, a past champion … thankfully I didn’t look back. What was it like to cross the finish line, look back and know you had held your ground against Eli Tomac? 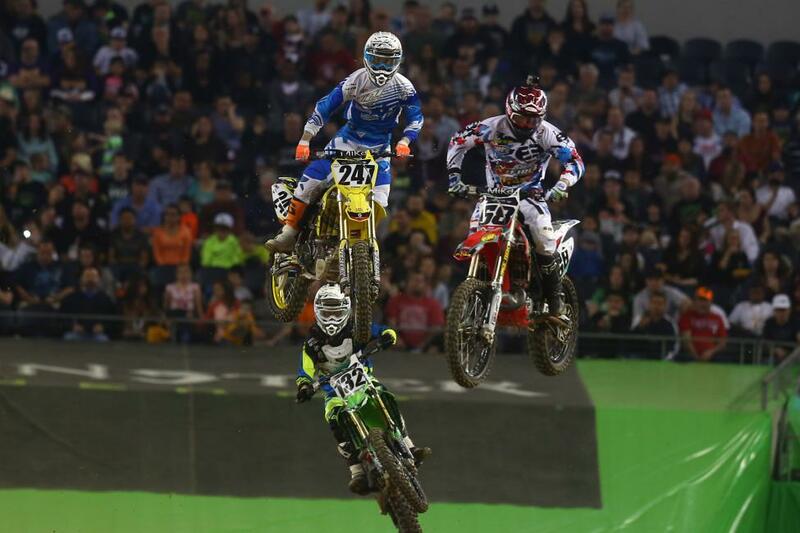 No disrespect intended, but it’s not often you get to battle with Eli Tomac and guys of that nature. What did if feel like? It was crazy. I looked back and it was Tomac and [Justin] Sipes and [Ivan] Tedesco, it was unreal. Those are some of the people I looked up to during my amateur career growing up. To finally get up there and battle with those guys is a huge confidence thing. Because you never believe you can do it until you actually get out there and ride with them and know that you can run that kind of speed. I’ve been training with [Justin] Sipes and that has helped out a lot—having somebody that is fast to battle with. It’s starting to come together and I want to keep the motivation going into next week and try and do the same thing. Your dad is involved with the Privateer Journey. Can you explain his role with the team? He runs the Privateer Journey. He basically does everything. He’s the manager, he feeds all the riders, he does all the PR work to get the sponsors so that it’s affordable to get to the races, which makes it cheaper for all the riders to get there as well. He drives to every round, he sets everything up—he’s just the boss man. While he is doing that he is also running a construction company at home. He’s doing it all. Sounds like a busy guy. What’s it mean to be able to spend time with your dad at the races? It’s awesome. It’s definitely a family sport. My mom does most of the cooking, so she is always there too. My dad is usually running around crazy. He’s a little tough, like most moto dads are, but we try and stay clear of him because he has so much going on in his head and I’ve got so much in mine. But at the end of the day you get to spend the night with your dad and mom. Especially in Dallas, I had my whole family there. It’s a family sport, which makes it an amazing sport to be in. The Privateer Journey typically has a ton of bikes underneath the tent. Tell us what it’s like to be part of that big of a team and what goes into a race weekend with that many riders under one tent? It’s good. We have plenty of riders and families setting up and helping out. The Privateer Journey is a huge family of privateers trying to get to the factory level. It’s one step from being there by yourself—you have people around doing the same thing. This is your first main you’ve made since Toronto in 2010. What’s it like to go that long and now finally get back to the pinnacle of the sport? Well, 2010 was kind of a main that I just go into. I think there was only like twenty riders there. So, I didn’t really count that as making it. It’s like I’ve been stuck in a hole the past four years—bad starts or always some kind of excuse or no confidence. You lose a lot of confidence when you start in the back. It was a good weekend when you almost make main. I’ve just been stuck in that rut for so long that I felt like I would never get out of it. To finally get out of that hole … I started to finally get better starts. Josh Demuth [former Arenacross champion] has been helping me recently. My trainer Mart Wisehart [and Demuth] have really been helping me get focused on starts, because that’s most of the race. If you get out front, it’s so much easier to make it. So, I need to get out front and put myself in a position to make it a lot easier. Justin [Sipes] was back this week as well. Talk about what it’s like to train with someone of his caliber? It’s awesome. He’s been staying with me since before Anaheim 1 and we have the same trainer so we are on the same program. He had a knee injury before the season and was just training to get ready for Dallas, but he’s been to all the races helping me out. He’s been watching and telling me what I can do to go faster, or where I can make up a little bit of time. It’s was crazy we both got in the main on the same weekend, so it looks like our training program is going good. We’ve just need to keep moving forward to the next week. Confidence can play a huge factor. How much has your confidence changed by getting back into the main? I would say looking at the lap times … I have never been so close to the top guys’ lap times and after starting out front and seeing me ride as hard as I can out front and seeing what kind of lap times I can put down just gave me a huge confidence boost. Just seeing that if I can get a good start I can do it. The potential is there I just need to be mentally ready every weekend. Thanks, Teddy. Who would you like to thank for helping you this season? I want to thank my mom and dad, my mechanic Josh Demuth, my trainer Mart Wisehart, FLY Racing, The Privateer Journey, ProMotoFan, Carl’s Cycle Sales, SCOTT, Yoshimura, Sikk Shades, Cometic Gasket, Shades of Gray, Rekluse, Moto Hose, Pivot Works, Dubya, Acerbis, Magik, Dunlop, PMP, Gaerne, Lucas Oil, Tokyo Mods, California Coast Plumbers, Galfer, Vertex, Hot Cams, Engine Ice, Moto Seat, VP Fuel, Mika Bars, Antigravity Dirt, and everybody that has supported my journey as a privateer. I appreciate it.